A full and healthy smile can prove to be one of your most confidence-enhancing features. On the contrary, having missing teeth may damage your self-esteem and affect the way you handle yourself both personally and professionally, not to mention the effect it has on your ability to eat. Dental implants can improve both your oral health and physical appearance, allowing you to regain your confidence and show your smile off with pride. There are several steps involved in dental implants. After the extraction of the tooth, the implant will be placed into the jawbone where the root once was. 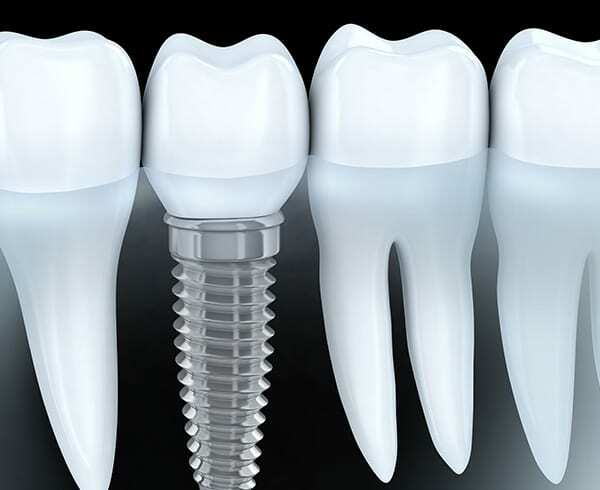 It will take three to six months for the implant and bone to form a bond and create the anchor for the crown (tooth). Sometimes, an abutment (a small metal post) is necessary to be placed on the implant to aid in the attachment of the crown (tooth). 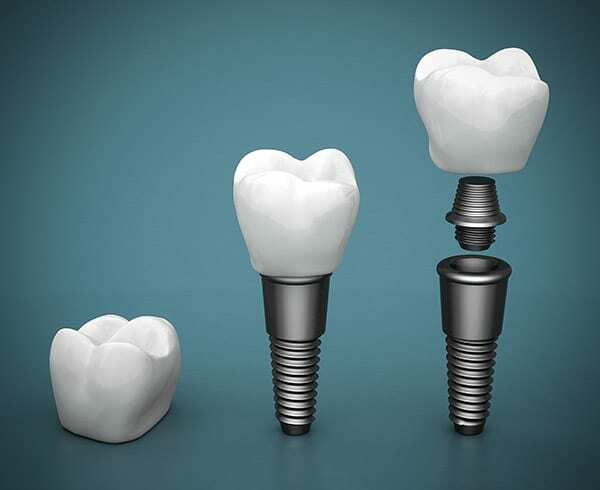 Once the implant has healed, the final crown (tooth) will be attached to the abutment, and your smile will be complete. Dental implants both look and feel like your natural teeth; they prevent future bone loss and gum recession while creating a natural-looking smile. The only people who will know you had dental implants are those you choose to tell. Unlike traditional bridges, dental implants do not harm the neighboring teeth. Bridges require adjacent teeth to be filed down to support the bridge. This can create additional problems down the line as bones may deteriorate, gums may recede, and the supporting teeth may decay. Since implants are inserted directly into the gum and bone, there is no need for the adjacent teeth to be used as an anchor. Fixed bridges or dentures may deteriorate over time, and they may make you cautious about eating certain foods. Dental implants allow you to eat anything you want without fear. Implants are secure, reliable, and when properly maintained, can last a lifetime. Missing or damaged teeth can lead to a lack of self-esteem. After dental implants, you will be able to smile, talk, and eat with confidence. Candidates for dental implants should be in good general and oral health and have realistic expectations. Candidates should have healthy gum tissue and sufficient bone in their jaw to hold the implant(s). Will I have to go without a tooth while I wait for the implant to fuse with my jawbone? After the placement of the implant, a temporary tooth may be worn over the implant until the final crown is attached. The cost of dental implants varies depending on the implant location, the actual implant and crown, whether or not bone grafting is required, and doctor’s fees. Dr. Salamati will provide you with an accurate cost estimate during your consultation. Dental insurance may cover a portion of your implants, and health care credit companies offer low-interest loans. Local anesthesia will be used during the procedure, and we offer IV conscious (moderate) sedation and general anesthesia, if necessary. Afterwards, you may experience some discomfort such as bruising of the gums, pain at the implant site, and minor bleeding. This pain is manageable and can be handled with pain medication. What if my bone has deteriorated? Adequate bone in your jaw is needed to support the implant, but if you have bone loss, dental implants may still be an option. Bone grafting can repair the jawbone by using bone from a tissue bank, or your own bone. Do I have to wait six months before my implants are completed? While traditional dental implants take three to six months to complete, you may be a candidate to get your teeth the same day with a procedure that provides functioning implants without the wait. Dental implants should be treated the same as your natural teeth. Consistent brushing, flossing, and dental cleaning (periodontal maintenance) will help to maintain your smile.